When I discovered New Horizons Designs and found the Tami Hoodie and the Portlanders, I went a little crazy. I really, really, really felt that they needed to be in my life and at that very moment. Fortunately for me, they were having a sale, and they quickly jumped into my cart! Lest you think I lay around in lacy bras and backless tops all the time (see previous post) you should know that I am much more of a sweatshirt, jeans, or sweatpants kind of girl. And...90% of the time you will find me in either my Tami hoodies or Portlanders (but that's a whole post of its own). I used fabric from Joanns for my pink and gray version. This is the regular length, side pocket, double cross over hood option. Yes, I believe the instructions were easy to follow but I would not say this pattern is beginner friendly. The pink and gray version took me forever to finish because of silly mistakes on my part. Here's a friendly tip...don't use a triple stitch seam when attaching your hood, baste it first! I accidentally sewed my hood on backwards and couldn't figure out why the top was choking me when I wore it. Ripping out the triple stitch took forever!!! This gray bonded knit is also from Joanns and the blue floral french terry is from Sly Fox Fabrics. I loved the look of the double cross over hood and the thumb hole cuffs. This was my first time sewing the cuffs and while I love them, I have learned they aren't the most practical for a stay at home mom whose hands are always being washed, doing dishes, cleaning up after kids, etc. 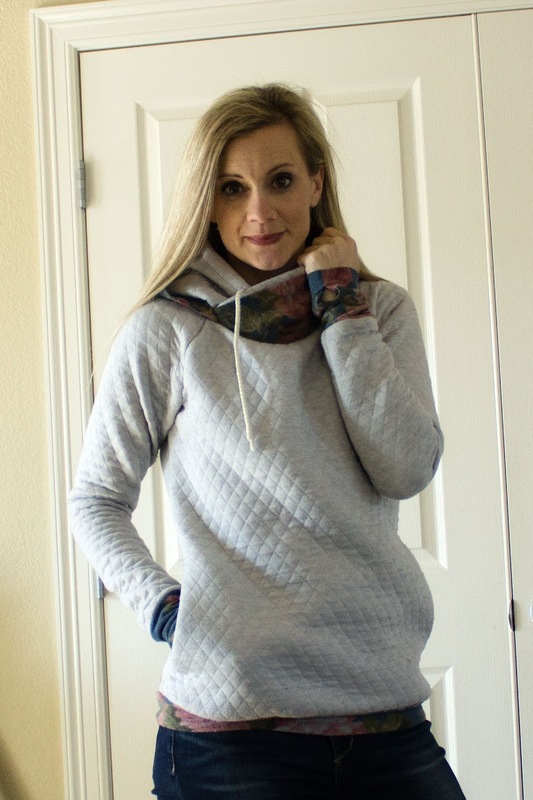 I love the slim fit of the sweatshirt and how cozy it is. I am usually always cold and this fabric is crazy warm. Pattern Alterations/Design Changes you made? Definetly, I have many more planned, just need to start cranking them out. 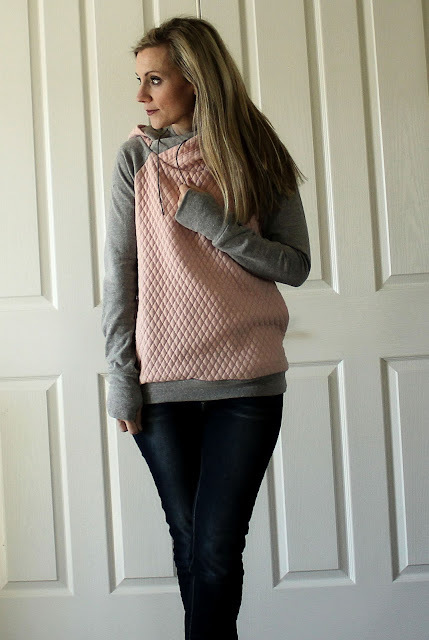 I would recommend this pattern to those who are comfortable sewing with knits and have some experience sewing clothing patterns.